Frédérique Constant Press Release – January 2009, Geneva -Frédérique Constant is proud to introduce its new “LOve Heart Beat” models. The new version of the highly successful Ladies Automatic Heart Beat series comes with an original dial design and in new colors. 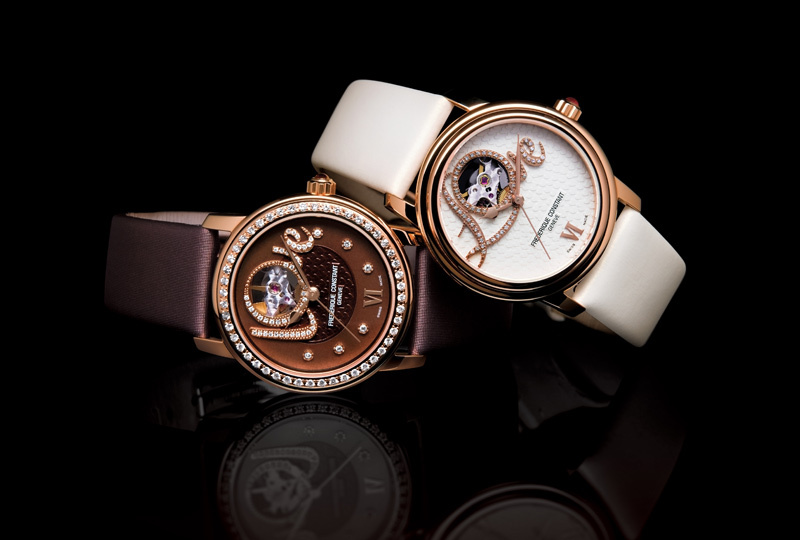 After the success of the first series of Double Heart Beat ladies watches, introduced in 2006, Genevabased Watch Manufacturer Frédérique Constant presents a new version of this passionately feminine wristwatch. A new creative timepiece designed by ladies – for ladies: the “LOve Heart Beat” models. After the worldwide recognized Double Heart Beat Dial aperture, which became an iconic product within the Frédérique Constant collection of Ladies’ watches, the new “LOve Heart Beat” model features a very special LOve aperture in the dial, set with diamonds and a liberally opened O-shape to let us discover the escapement of a finely decorated automatic movement, also visible through the back of the case thanks to the sapphire crystal. The case shape is gently rounded with a diameter of 34mm and the fine ‘godron’-decoration all around the bezel gives the watch a timeless elegance. The dial, decorated with a subtle heart-shaped guilloché finishing, features a charming LOve opening at 12 o’clock, set with sparkling diamonds, which reveals the beating of the heart of the watch. Every details of the “LOve Heart Beat” watch has been designed with passion to reflect the values and aspirations of today’s women. And, as the name of the watch shows, more and more women greatly appreciate wearing an automatic watchmaking piece, combined with feminine touches. Moreover, the Frédérique Constant “LOve Heart Beat” watch is a delicate wink for men, who want to offer a present to their lady-loves. The “LOve Heart Beat” watches are presented in different trendy colors: in rose gold plated with either a sweet vanilla or a gourmet chocolate finishing, and in steel with a romantic opaline and mother of pearl dial finishing, set with shiny diamonds varying in number according to the different versions, which will perfectly blend with the current fashion trends…. These new timepieces are an ode to femininity and…. LOve.